In the book and antique trade auction houses are referred to as 'the rooms.' At Alcoholics and Narcotics Anonymous 'the rooms' refers to the ad hoc meeting places where addicts gather to share their experiences of recovery. The difference between the two is that book dealers are suffering from an addiction from which they will never recover. Some dealers have both addictions and thus spend much time shuttling between 'the rooms' and 'the rooms'. 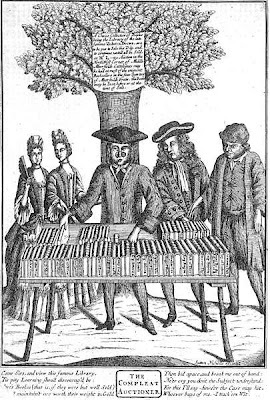 Anyway, one bright June morning in 'the rooms' dealers were gathered to do battle over some choice items from a deceased gentleman's estate--large and important books from a country house library. It was London book fair week and buyers had flown in from America and come through the tunnel from Europe. From the beginning one buyer emerged as a major purchaser. He was an eccentric millionaire type in a white suit and straw hat buying fairly randomly, but when he bid he didn't drop out and dealers, as is their wont, had started to bid him up. This can be a risky business but can earn the dealer kudos as an important player. A 4 volume first of Jane Austen's mock gothic tale 'Northanger Abbey' thus made a stonking £40,000 - a world record for the book that occasioned some mild applause. The man in the white suit was just getting stuck into some Darwin firsts when there was a loud kerfuffle in the room and 4 nylon coated nurses escorted the protesting bidder out into the street. He had been on day realease from a mental home in a London suburb. The lots were then offered again - many making half what they had made when the Bedlamite was bidding. 'Northanger Abbey', apparently a very ordinary copy, was 'bought in' at £8000.